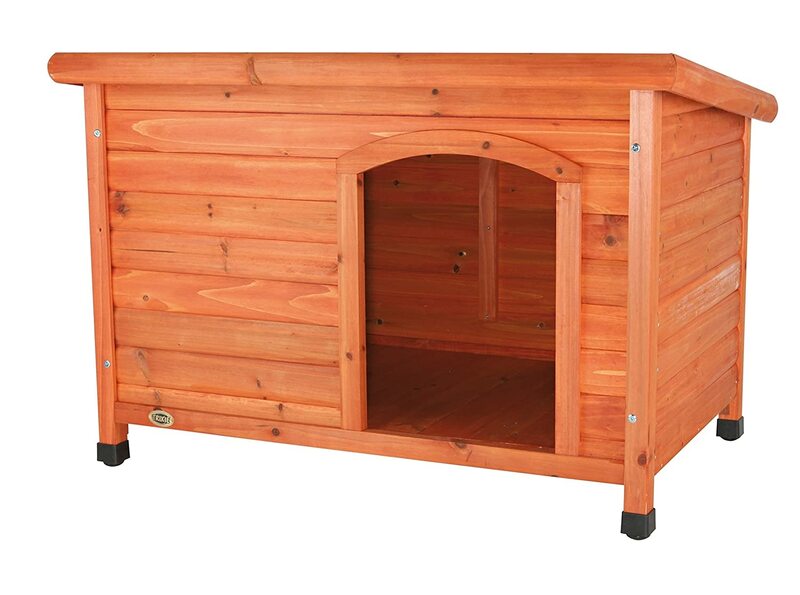 Give your pet a place to escape the elements with our Dog Club House. Our solid pine construction and use of the finest materials means this shelter will endure years of use with very little maintenance. Benefits include a draft resistant tongue-and-groove exterior that is finished out with a weatherproof sealer both inside and out. The flat, hinged roof is covered with composite shingles and can be propped open using two locking arms for additional ventilation, as well as easy cleaning. The adjustable, extra-high plastic-tipped feet allow you to level the house on uneven ground and also provide extra circulation underneath. This will help keep the floor cool in the summer and warm/dry in the winter. Trixie has also provided a removable floor for easy cleaning, a unique feature not found in many other dog houses. This shelter is suitable for large/XL breed dogs weighing up to 95 lbs. (ex: Golden Retriever). Compatible with TRIXIE’s plastic dog door (Item #39573) which is sold separately. Quick and easy assembly. One year warranty. Color: glazed pine. Dimensions (inches): 46 x 31 x 32; door opening 13 x 20. Weight: 52 pounds.